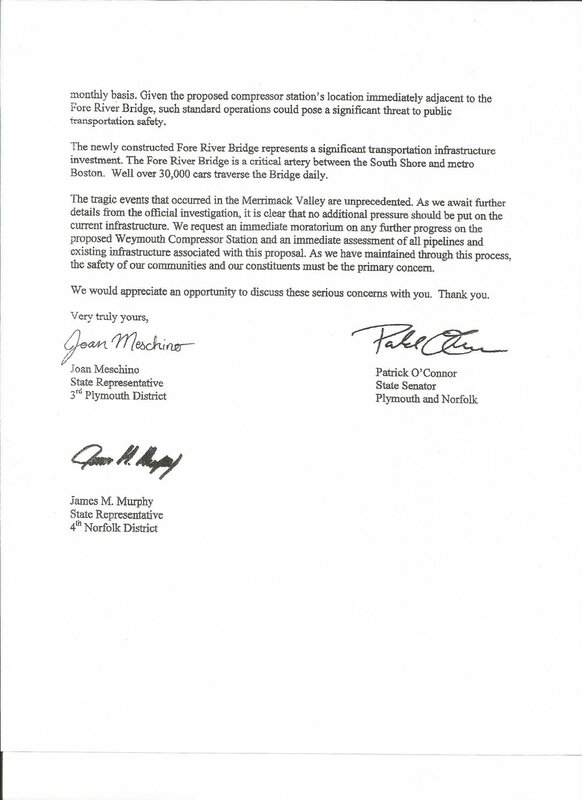 Local state reps and senators, including Joan Meschino, James Murphy, and Patrick O’Connor, sent a letter to Matthew Beaton, secretary of the Executive Office of Energy and Environmental Affairs, and Stephanie Pollack, secretary and chief executive officer of the state Department of Transportation, in response to the tragic gas explosion in Lawrence and Andover last week. They are asking that the compressor station proposal be put on hold until a public transportation safety impact study is conducted. “Officials have said the pressure in the natural gas pipelines under the three communities spiked to 12 times their normal level prior to the explosions. Compressor stations are placed along pipelines to pressurize gas so it continues flowing. 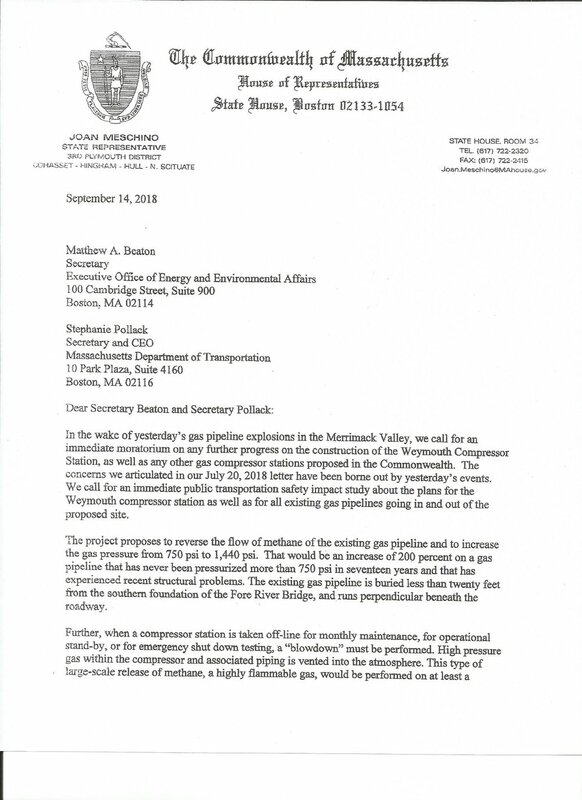 The compressor station in Weymouth would reverse the flow of methane in the existing gas pipeline and increase the gas pressure from 750 pounds per square inch to 1,440 pounds per square inch. “That would be an increase of 200 percent on a gas pipeline that has never been pressurized more than 750 (pounds per square inch) in seventeen years and that has experienced recent structural problems,” the letter reads. “The existing gas pipeline is buried less than twenty feet from the southern foundation of the Fore River Bridge, and runs perpendicular beneath the roadway.”’ (The Patriot Ledger). Thank you, again, to our amazing delegation!